Sheau-yueh J. Chao has written what should become the definitive English-language introduction to the origin of Chinese family names. In Search of Your Asian Roots: Genealogical Research on Chinese Surnames, published by Genealogical Publishing Co. Inc., for Clearfield Company, is a concise genealogical analysis of more than 600 names and their variants. 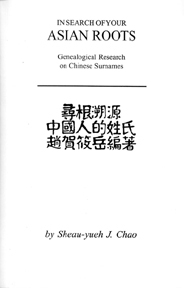 The first chapter summarizes the history of and body of research on Chinese surnames, as well as explains why the spellings of names have changed throughout history. The heart of the book, chapter two, delivers a valuable analysis of 600 surnames, documenting the origins of the name, the regions with which the name was associated, and reasons why the name has changed through the centuries. The third chapter -- important to those who want to delve further into the literature on Chinese family history -- is an extensive annotated bibliography on Chinese surnames. The listings include both English-language and Chinese-language research. The book is equipped with separate indexes for family names, authors, titles and Chinese-character stroke numbers, which are another way to organize Chinese characters. Other useful features include a glossary, a timeline of Chinese history, and a Pinyin to Wade-Giles conversion table for those unfamiliar with the Wade-Giles method of romanizing Chinese sounds. The primary weakness of this book is its layout, which -- in journalistic terms -- is pretty gray. In other words, it's not much to look at. There are not illustrations to break up the type. But what the book lacks in visual appeal is more than made up for in its information content. One warning to those who speak (or whose ancestors spoke) dialects other than Mandarin. The book follows Mandarin styles. For example, the name of my ancestors, who came from Guangdong (Canton) province, pronounced their name "Yee." At first I could not find any information on my surname in the book because I looked for "Yee." Recently a immigrant from Taiwan looked at some of my family letters and pronouced the family name as "Yü." When I returned to the book and looked up "Yü" and matched the characters, I found my family's name (it's surname No. 603 on p. 210). I learned that my surname originated from the name of a minister in the Ch'in Dynasty (221-206 BCE). The family settled primarily in She hsien, Anhui province. The author, a staff librarian at Newman Library at Baruch College, has consulted nearly 200 books of ancient Chinese literature housed at Columbia University's East Asian Library, the Harvard-Yenching Library at Harvard University and the Library of Congress while researching In Search of Your Asian Roots. She should be commended for making this vast body of knowledge accessible to the English-speaking world. Questions? Comments? Send them to David M. Lawrence.